Sometimes an app gets stuck in the downloading process and it won’t finish downloading. If you tap on the app on the home screen that may toggle the downloading state on and off, and sometimes this restarts the download process and the app finishes. But more often this doesn’t really help and the partially downloaded app just sits on your home screen in their partially downloaded state. This really annoys me especially when it happens to a huge number of apps when I’m restoring a device using a previous backup. The first thing to try is just deleting the app right on the home screen and then downloading it again. You do this by long pressing on the app icon until a little black X appears in the top left corner and all the app icons are wiggling. Then tap on the X and the app will be deleted. If that doesn’t work you can still delete it by going to Settings – General – Storage & iCloud Usage – Manage Storage and then waiting for your device to display a list of all the apps on it. The list is displayed in size order (data in GB’s or MB’s). Scroll down the list looking for the problem app. Look carefully because you may see only the app’s icon or sometimes even just a partial icon without the app’s name. But it has to be there so just keep looking until you find it. When you do find it, tap on it and you’ll be taken to another screen that displays the amount of storage that the app is currently using as well as the delete function. The words Delete App should appear in red letters at the bottom of this screen. Tap on Delete App, and the app will be gone. Then go back to the App Store, find the app in question, and download it again. Refer to the photo below. 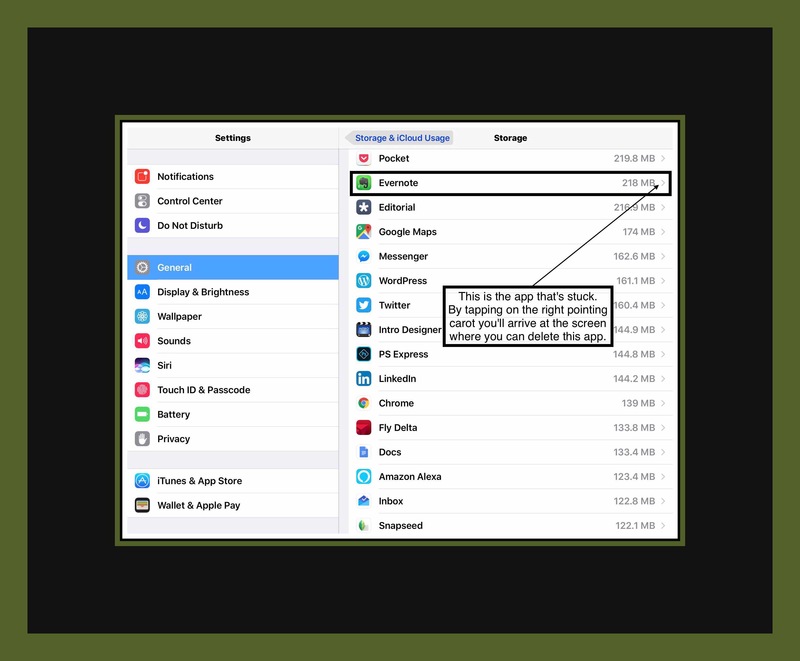 The bottom left screenshot shows the screen you arrive at in Settings – General – Storage & iCloud Usage – Manage Storage then tap on that apps icon. If every other option fails to solve the problem try this little hack to reset the App Store’s cache. Open the App Store app and select one of the menu headings at the bottom of the screen (for example ‘Featured’ ‘Top Charts’ etc.) Tap 10 times consecutively on the same icon...your iPad’s screen should go blank for a few seconds and when it’s done the App Store should function a lot faster and better. This is a little trick that popped up on Twitter recently and it really works! I tested it out and my App Store problem was solved! Apparently this also works for other ios apps…I think for iBooks and maybe iTunes…but not all of them. It really can’t hurt to test it out if need be because the worst case scenario is that nothing at all would happen. This can especially be important if the app is large in size in terms of bits and bytes. When you redownload the app make sure you’re in an area where the network strength is good and ideally where you have a WiFi that you can connect to. Although even if you’re on wifi it may be one that has low bandwidth, like those that are available at 99% of the hotels and motels in the US. I really think that poor network strength (both # of bars and bandwidth) may be one reason that apps don’t download correctly. So, waiting until you’re in a good network environment to redownload the app may be useful for some people. I’m pretty certain that the reason my new iPhone 6s was in such a tenuous state in terms of apps installing was due to the fact that we were traveling and relying on hotel networks. This update has a lot of bug fixes…some of them address apps getting stuck downloading or installing in an Enterprise environment…but it might solve problems in other environments too. To do this just go to Settings – General – Software Update and search for an update. If your device finds that the update is available for you it’s a good idea to close background tasks and plug your device in. Also don’t do this if the battery is really low…charge it until it’s at about 50%. Make sure your WiFi signal is good too before beginning the download. There’s one very good reason to update to ios 9.2.1. A cookie hack was discovered a while back that can put the security of ios devices in jeopardy if they are using public WiFi’s. It’s a serious threat and this update fixes the problem. If you want to read more about the pluses and minuses of this update this Forbe’s article has the best overview that I’ve found. This entry was posted in Apple, ios, ios 8, ios 9, ios 9 Quick Tips, ios apps, Tech Tips and tagged fix ios app that's stuck, ios app install solution, ios apps don't download, problem iPad apps, problem iPhone apps. Bookmark the permalink. Best solution! Solved my problem with iMovie stucked on the screen! Thanks a lot! You’re welcome! I really appreciate your nice comment because software updates frequently change what works. I try to recheck each post periodically, but it’s almost impossible to keep up with it while growing my site too.